This old-fashioned, chewy candy is filled with dried fruit and nuts. The snowy confectioners' sugar coating makes it look holiday-festive. They're by no means "gourmet;" but for us "regular folks," and those of us who remember and appreciate "Grandma's home cooking," these little gems are a delight. 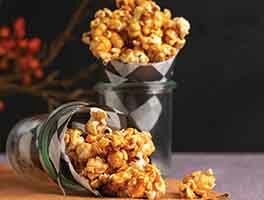 If you enjoy this recipe, check out a couple of our other favorite candies: Dark Chocolate Buttercrunch, and Choco-Mallow. Lightly grease a 9" x 13" pan. Line with parchment, and grease the parchment. If you don't have parchment, use waxed paper or plastic wrap. Place the nuts, dates, coconuts, and cherries in the work bowl of a food processor, and process until finely chopped, but not puréed. You may also do this using an old-fashioned food grinder. Melt the marshmallows in a double boiler on the stovetop, or in a microwave. Stir till smooth. Place the chopped nuts and fruit in a bowl, and stir in the melted marshmallows. Use your hands to thoroughly combine marshmallow and fruit/nuts. This will be a very sticky business; it helps to rinse your hands with cold water frequently, then plunging back in with them wet, not dried off. Press the mixture into the prepared pan, smoothing the top as best you can. Cover with plastic, and let set till cool, preferably overnight. Next day, cut the candy into 1" squares. 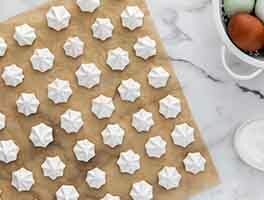 Place the squares, 6 or 8 at a time, into a plastic bag with confectioners' sugar. Shake to coat with the sugar. 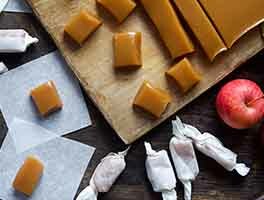 Place finished candies on a rack until all are coated with sugar, then wrap loosely in plastic to store. Save yourself the trouble of melting marshmallows by substituting a 16-ounce tub of Marshmallow Fluff®. For richer flavor, toast the almonds in a preheated 350°F oven for about 15 minutes, or until they're golden brown. This recipe has intrigued me since it came out last year. I love all the ingredients (dates, nuts, etc), and so decided to give it a try. I wish I could say that I love it, but for me and my family, it's just an OK confection. I will say that the flavors of the individual ingredients do shine through, and it has a satisfying chewiness/crunchiness. Although easy to make, it's messy. If you love rice krispies bars and love making them, give this a try. For me and my family, I would rather spend the time with my hands in a big bowl of bread dough making cinnamon rolls!! I am glad I gave it a try, though. I started off grinding the nuts--bad decision, they were too fine, not giving texture in the bar and the peanuts over rode all other flavors. I chopped the rest of the fruit and KA cherries, used the special non melting powdered sugar and they cut beautifully and look great. This recipe was a trip back to childhood! Have made it several times - the original and several variations. Substituted candied pineapple in one version; cut them in diamond shapes and dipped in dark chocolate in another. Added 1/2 cup of finely ground pecans to one batch. Had a handful of left-over chocolate covered pretzels, so chopped them up and added to one batch. This recipe is easy and fun, fun, fun! I don't have a pastry roller, so I lightly oiled the bottom of my potato masher and used it to press the mixture into the pan. Also, I used dried sweetened cherries instead of marachinos (not a big fan of marachinos) I didn't have good luck with the sugar in the bag method - I thought it coated the pieces too heavily so you couldn't see what type of treat it was, I ended up putting some sugar on top of the parchment in the pan it had cooled in and gently rolled them around to lightly coat them. That worked perfectly, and more quickly, too! It seems like you could do endless variations of this recipe- crystalized ginger?, dried blueberries? 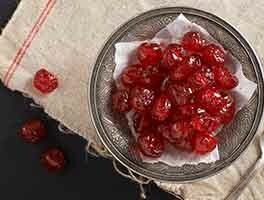 dried cranberries? 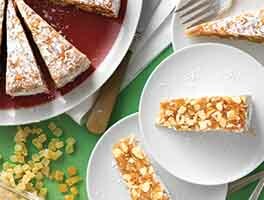 We enjoyed this recipe, it made lots and is a nice change from cookies and chocolates. very weird: I've made this from a recipe in a novel several years ago -- "I Want It Now Fruitcake" -- and it's almost word for word the same. I occasionally make a small batch for holiday office parties; always disappears. Good for people with a crazy sweet tooth. But it's way too "kiddie" for my taste. I made these with the Marshmallow Fluff and chilled them in the refridgerator for a few hours. They firmed up beautifully. 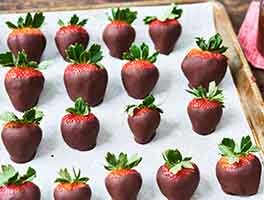 They are delicious and there is so much that they will make perfect little gifts and still have plenty for my family. One thing that helped in cutting them was to coat the top with powdered sugar and it made slicing them easier and not so sticky. I had called the KA's bakers to ask for advise before doing this and the person I spoke to wasn't very helpful so I devised the cutting scheme myself. Sorry we couldn't help you out with this one, but glad to hear you worked it out. Thanks for sharing your tips. Made half a batch with the kids, letting them measure all the ingredients and dump into the bowl of the food processor. Came out really good and everyone enjoyed it. A nice change of pace from all the chocolate and cookies this time of year. Absolutely delicious. It doesn't look too terribly exciting when you make it, but be careful... it is difficult to keep you hands out of the finished product because it is SOOO delicious. Also, this makes a VERY LARGE volume... we made 1/2 recipe and it was so very much. If we had made the entire batch, we would have had a "Christmas Delight" explosion in our kitchen. Don't use marshmallow fluff, or the candy won't set up. At least mine didn't. But it was delicious.